Then last fall came, and just as I had finished creating the first batch of 97 pieces for Rock the Dogs auctions, Tom Petty passed away. It was a sad day and I felt such loss that it surprised me. I had never seen the Heartbreakers in concert but I certainly felt deeply connected to the band. Over the course of those 6 years, I had fallen in love with their music, just like so many of you. I had held their strings in my hands and those moments were so special for me. As I watched people marvel at our work, I felt such pride in the work I had done. Many of the fans became fans of our jewelry and cause. They reached out to me, we benefited from the new customers base but new friendships that happened were the greatest blessing of all. 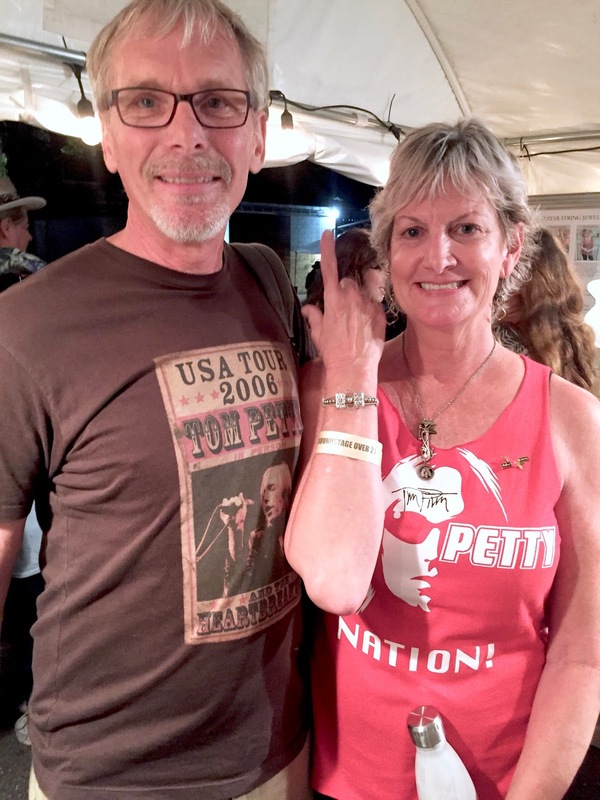 This past weekend, Glen and I had the great joy of attending the Birthday Bash for Tom at Gainsville, Florida. What a weekend it was!!!! From the moment we arrived, friends began greeting us. I got more hugs this past weekend than ever in my life! I felt like a celebrity! Really!!! I can say the Tom Petty fans are a class all their own. They are kind, generous, gracious, giving, loving and passionate people. I created custom pieces of jewelry all weekend long and what a joy it was to have my fans stand beside me as I worked. We laughed, chatted, shared stories, hugged and kissed each other and shared in the joy of the moment as we celebrated Tom's music. And while I created, Glen was busy snapping photos of all the cool T shirt designs. Such a hard job...lol! What a weekend!!!! I thank each fan who has become fans of ReThrive jewelry! You are loved beyond words because indeed you all love unconditionally! I saw the true character of so many people who did not really know us, but yet they embraced us with such graciousness that my heart overflowed as we drove back home to Savannah. It was truly so much to take in. New bonds of friendship were born this past weekend and we look forward to next year with great anticipation. Petty on my friends!